Blood pressure is the pressure the blood circulating in your blood vessels exerts on your blood vessel walls. You will usually hear your blood pressure in a combination of one number over the other, for example 120/80 (which is considered a normal blood pressure). The first number is your systolic blood pressure or the maximum pressure in one beat. The second number is your dystolic blood pressure and is the minimum pressure between two beats. Blood pressure is measured in mmHg or millimeters of mercury. Blood pressure is measured using a cuff wrapped around your upper arm. This machine has a cool name. It’s called a mercury-tube sphygmomanometer! (That’s fun to say right?) The cuff inflates with air cutting off your blood circulation and as it begins to loosen it can detect the pressure high and low of the blood circulating in your vessel. Along with lifestyle choices what we choose to eat and what we choose to drink can directly affect our blood pressure. High blood pressure known as hypertension is a reading over 120/80 for a sustained period. 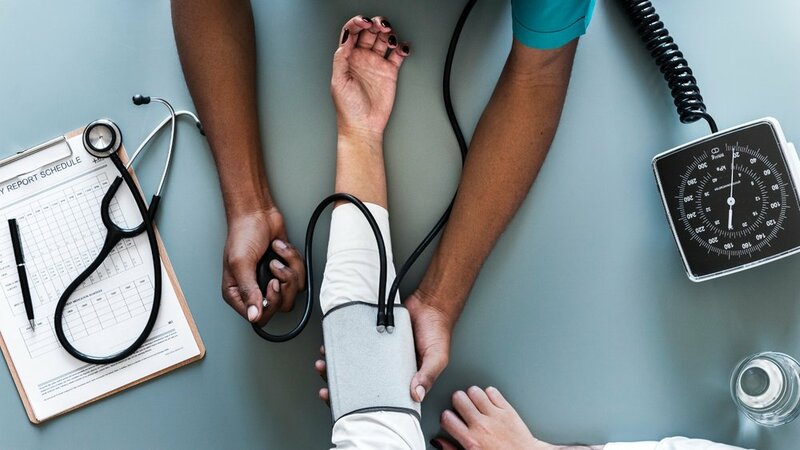 There are some known factors that are known to contribute to high blood pressure such as consuming too much table salt, being overweight/obese, drinking excess amounts of alcohol and smoking. It has been proven that changing your nutrition and lifestyle can improve blood pressure issues. Having low blood pressure is not as big of a concern medically unless you are experiencing symptoms that affect your every day life. These symptoms can include dizziness, especially when going from sitting/laying to standing, or if you faint. In these rare cases it is recommended that you seek medical attention. Having high blood pressure is much more troublesome and symptoms may not show up for many years which is why it is termed a “silent killer”. With high blood pressure the heart gradually grows larger and larger and less and less efficient. The blood vessels of the kidneys, eyes and other parts of the body can become damaged. As blood pressure goes up, artery walls become thicker and stronger and because of this narrower as well. When vessels become too narrow blood flow is slowed and even stopped contributing to the risk of heart attack and stroke. When is the last time you had your blood pressure checked? How can nutrition help? The best ways to reduce blood pressure include reducing your use of table salt and to work to maintain a healthy weight. There is a specific “diet” outlined for those suffering with hypertension called the DASH diet. DASH stands for Dietary Approaches to Stop Hypertension. It focuses on adding more fruits and vegetables, whole grains, reducing table salt, troublesome fats and especially alcohol. It has been clinically proven to lower blood pressure, reduce cholesterol and improve insulin sensitivity. There are also specific foods that you can add to your eating plan that will help significantly without going on a full “diet” plan. Foods like dark leafy greens because they are high in potassium which helps rid the body of sodium, beets which are high in nitric oxide to help open your blood vessels and wild caught fish for Omega 3 fatty acids to help lower inflammation systemically are just a few. Want to get even healthier? Are you dealing with high blood pressure? Could you use some support figuring out what foods you could add to your everyday to support lowering your blood pressure? Curious about how health coaching can help you make healthy changes? Let’s talk! Schedule an initial complimentary consultation with me today—or pass this offer on to someone you care about! Visit www.noshoesnutrition.com and sign up for a FREE consultation. I work with people from all over the world individually or in groups so don’t let anything hold you back!